Ian Fohrman is a writer and photographer out of Denver, Co. He is a partner in The Public Works, a unique creative agency with capabilities ranging from engineering and high end fabrication to multimedia production and web design. He has been writing and shooting editorial in the snow world for almost 10 years with features in every North American ski publication. He also has a background as a Red Bull photographer, commercial photographer across many genres, as well as ski-mountaineering photographer. 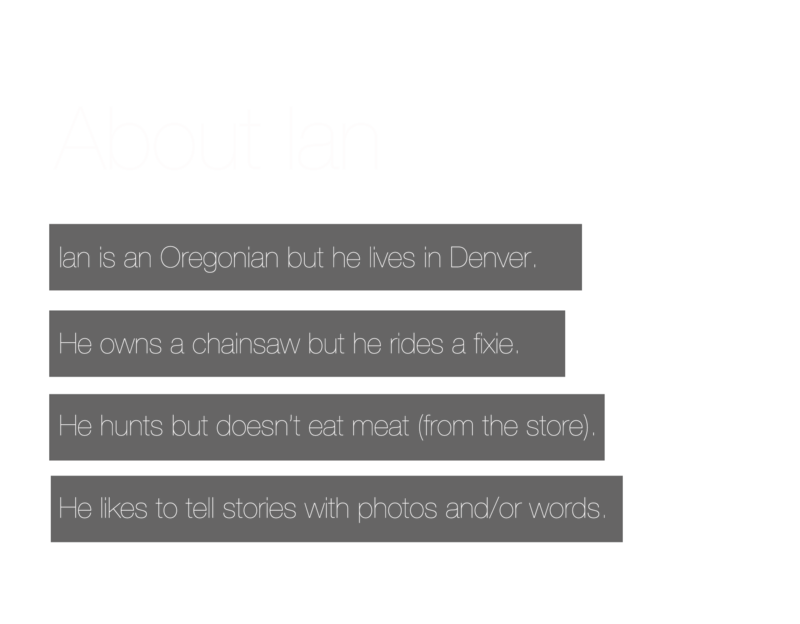 Ian has had various “real jobs” throughout his career, most notably, from 2005-2010 Ian managed the Helly Hansen Global Snow Sports Marketing program where he wore a lot of hats but was more business guy than content creator. Currently he creates more words, videos and photographs than spreadsheets but still knows his way around a budget doc or marketing matrix. Ian would rather be outside or on the road doing something challenging and making beautiful imagery and thought provoking stories than almost anything else.